Arowanas originate from natural rivers, resulting in their special body structure, build and survival habit. Most, if not all Arowanas are fed on live or frozen food in captivity. As such, the chances of infection from parasites/diseases are high. As Arowanas are sensitive to medicinal treatments, it is essential to be very careful in medicine selection as the use of wrong medication will harm, and in the worst case, cause death of the fish. Due to the above mentioned, Arowana keepers always face great difficulty in choosing the right medication for their fishes. A lot of times, unnecessary delay is caused by the delay of selecting the right medication, therefore prolonging the essential treatment period. To solve this problem, Ocean Free® spent many years on the research/study of Arowana healing through Arowana farming and working with Arowana hobbyists. 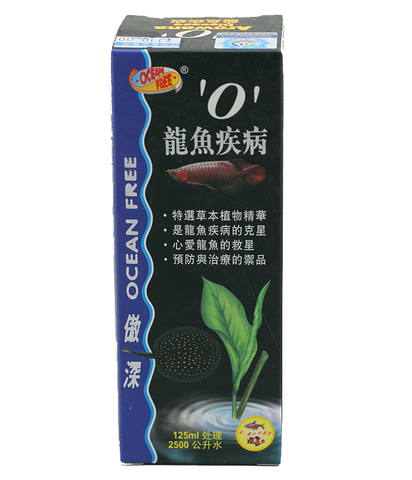 The product is tested under different weather conditions, water quality and habit of Arowana rearing. Arowana types tested range from premium Violet Fusion Red strain to Green Arowanas. Exotic wild caught freshwater stingrays were also included in the experiment. The result is the breakthrough and effective Herbal remedy, Ocean Free® Arowana ‘0’ Disease. Formulated with natural extracts from herbal plants, there are no side effects or residue problems. This product is environmentally safe and do not cause pollution. It is also high in safety density in regards to dosing, and it is indeed the ultimate cure for most diseases. Functions as Bactericide, Parasitic, Fungicide, Gill Disease cure and prevention of most diseases. As long as right dosages are administered, the success rate of curing is high. For prevention purposes, a bi-weekly dosage is enough already this will help Arowanas to be prevented of all the said diseases. A definite must have product for all Arowana lovers. Bacteria infection: Rotting of tail, body, fin, head, popping eyes, ulcer, dropsy and infection of wound etc. Parasite infection: White spots, cloudy eyes, body slime, small sized external parasite (hexamita, trichodina, nematodes etc) and gill flakes etc. Fungus infection: Cotton wool disease of tail, body, fins, head and fungi infection. Gill disease infection: Rotting gills, sleeping disease, abnormal movement of gills and all other gill related diseases. Kills bacteria and improve water quality. Stop cross infection of new entrant fishes in existing tank/pond. Add 1ml per 10L of water. This process can be repeated in 5 days time and no water change is needed. Only after medicinal treatmet process, the need to change water or not can be gauged. For preventive dosage, add 1ml to every 20L of water in every two weeks time. When there are new entrant fishes, dose 1ml to every 10L of water. Do so every 3 days to totally eradicate bacteria and parasites.